In an interview with RPS, Ubisoft worldwide games director Stephanie Perotti divulged that the company is dropping its infamous always-on DRM strategy. In fact, Ubisoft already quietly euthanized the program a few months ago -- probably following the From Dust fiasco -- but now it is official. Ubisoft has perhaps been the largest proponent of always-on DRM, incorporating it into many high-profile games. The company has gone on record stating that always-on DRM schemes have shown a clear reduction in piracy, but Perotti said she considers that an "unfortunate" comment, alluding the fact that Ubisoft has always refused to publish any substantive data. While Perotti and corporate communications manager Michael Burk managed to deftly skirt around most DRM-related questions, but they did assure RPS that always-on DRM is buried and gone. From now on, Ubisoft will rely on simple, one-time activation methods. 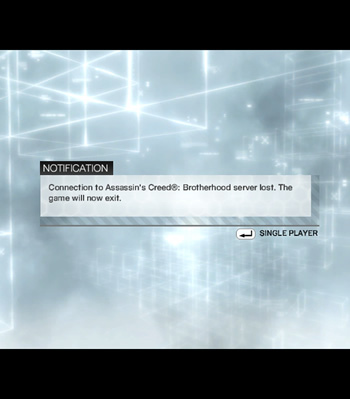 Cited as an example, Assassin's Creed 3 will require a one-time activation, but may be installed on an unlimited number of computers. And, in an unusual twist for the company, the game will allow single-player action without an Internet connection. Always-on DRM has frequently been criticized as an unnecessarily draconian form of digital rights management, namely due to its burdensome nature for legitimate, paying customers. When conditions aren't ideal (e.g. poor internet service, PC upgrades and server issues), most always-online solutions break down -- even in single player -- and quickly convert what would otherwise be joyous fun into utter frustration. Interestingly, the overwhelming majority of readers who responded to our poll claim DRM-related issues have spoiled their fun on at least one occasion. Additionally, the efficacy of always-on DRM continues to be questioned. While it may curb casual copying, studies have shown inconvenient DRM measures may actually increase piracy. Meanwhile, hackers and crackers seem to always find a way to circumvent even the toughest DRM mechanisms and have even exploited such schemes in dangerous ways. Although PC games account for only 7 percent of Ubisoft's sales, Perotti said that Ubisoft is working hard to close the gaps between PC and console games. The company has been criticized by PC gamers for not adequately tailoring cross-platform games, leaving PC ports too "consolified" for PC-gaming tastes. Also, console releases frequently ship months ahead of their PC counterparts -- another issue Ubisoft is aiming to address.